We’d love your help. Let us know what’s wrong with this preview of The Long Utopia by Terry Pratchett. It is the middle of the twenty-first century. Now an elderly and cantankerous AI, Lobsang is living with Agnes in an exotic, far-distant world. He's determine It is the middle of the twenty-first century. Now an elderly and cantankerous AI, Lobsang is living with Agnes in an exotic, far-distant world. He's determined to lead a normal life in New Springfield—they even adopt a child. But there are rumors, strange sightings in the sky. On this world, something isn't right. . . .
To ask other readers questions about The Long Utopia, please sign up. Neil According to news articles, the 5th and final novel was completed before Terry Pratchett's death and will be published in 2016. …moreAccording to news articles, the 5th and final novel was completed before Terry Pratchett's death and will be published in 2016. Something I forgot to look up while reading this book: Towards the end, I think in the last scene where Losbang, Sally and Stan are together, they quote something. It's either a movie or book - each character quoting a line. It seemed familiar but I couldn't place it. Anyone know what they were quoting? Neil The opening scene from Macbeth where the three witches meet in a storm. I am not sure why I left it so long between book 3 and this one but luckily I still had a good memory of what went before. There is nothing worse when reading a series than forgetting who did what to who in the earlier books! I really enjoyed The Long Utopia. I think I now have my head around 'stepping' and millions of parallel worlds. I even coped with Lobsang moving from one body to another and working alongside one of his own alternate selves. I was upset with what happened to Sally, Stan and I am not sure why I left it so long between book 3 and this one but luckily I still had a good memory of what went before. There is nothing worse when reading a series than forgetting who did what to who in the earlier books! I really enjoyed The Long Utopia. I think I now have my head around 'stepping' and millions of parallel worlds. I even coped with Lobsang moving from one body to another and working alongside one of his own alternate selves. I was upset with what happened to Sally, Stan and the cat. There is a lot of explanation in this book. We find out some of the history of natural steppers and start to understand more about the Next. We also experience an alien invasion of amazing proportions. There is more out there outside the Long Earth. I will not wait so long before reading book 5! The first book in the Long Earth series captured my imagination to a degree that's rare. The world of the Long Earth is stunning. The characters Mr. Pratchett and Mr. Baxter created are fascinating individuals and it's a rewarding experience to spend time with them. When I read a book, I want to feel like the story exists for its own sake. I want to feel like the authors are compelled to The Long Utopia by Terry Pratchett and Stephen Baxter is my favorite book of this series, since the first one. When I read a book, I want to feel like the story exists for its own sake. I want to feel like the authors are compelled to tell this story, and no other. But the stories in The Long War and The Long Mars feel like they exist mostly as excuses to explore the expanding world of the Long Earth. This isn't to say that the stories haven’t been good—they're well-structured and well-told, populated by characters who I care about—but I can't shake the feeling that different stories would have served the purpose just as well. Exploring the world takes precedence over telling the best possible story. With the fourth book of the series, The Long Utopia, the story finally takes its place front-and-center. Compared to its predecessors, the characters in The Long Utopia don’t spend much time travelling. The bulk of the narrative takes place in a few specific locations. This grounds the story and gives it a focus that makes it easier for me to immerse myself more deeply in the novel. Rooting the characters in a specific place lends tremendous power to the climax and conclusion of the book. Just like the first three novels in the series, The Long Utopia opens up new vistas in the Long Earth. The primary conflict of the story results from a quirk in its cosmological topology, with profound implications. But in a new twist, the authors expand their world historically, as well as geographically. We learn much about the history of Steppers by following the exploits of one of Joshua Valiente's ancestors. With their fourth entry in the series, Mr. Pratchett and Mr. Baxter are wise enough to realize that they need to switch things up from the travel adventure structure that defined the first three books. A less peripatetic narrative structure turns out to be a more solid foundation on which to create a more compelling story. In The Long Utopia, the story finally becomes more important than the world. As a result, I find myself more deeply invested in the action and the outcome. I took this volume and the next on holidays with me. Plenty of time on the beach, waiting for flights, on flights etc to read. And these books are the perfect holiday reading material - short chapters, easy prose, great concepts. The Long Utopia carries on the story of the main characters of Joshua, Lobsang, Sally and a few others, this time concerning the Next, homo superiors, and Lobsang's retirement with Sister Agnes to raise a family. Of course, things go wrong in a plot-movingly way. This i I took this volume and the next on holidays with me. Plenty of time on the beach, waiting for flights, on flights etc to read. And these books are the perfect holiday reading material - short chapters, easy prose, great concepts. There is a certain point in a series where a reviewer has to accept that the series is not going in the direction they expected, and either give up reading, or give up being critical of installments that don't confirm to expectation. You see I loved The Long Earth, and got really excited by the dramatically titled The Long War. Nonetheless I was disappointed by both War and Mars. There just seemed so many cool story lines not fleshed out, the weird giant blob-beetle travelling the earths, the te There is a certain point in a series where a reviewer has to accept that the series is not going in the direction they expected, and either give up reading, or give up being critical of installments that don't confirm to expectation. You see I loved The Long Earth, and got really excited by the dramatically titled The Long War. Nonetheless I was disappointed by both War and Mars. There just seemed so many cool story lines not fleshed out, the weird giant blob-beetle travelling the earths, the tension between steppers and non-steppes and so on. However, it seems unfair to review books based on what I thought should happen. For this reason I approached Utopia with an open mind. Much like the worlds spanning both directions from datum earth, endless story lines seemed to be introduced, I found myself struggling to grasp onto any as the key tension. Was I meant to be intrigued by Joshua's rather Dickensian family history? The reveal that possibly people could step North and South as well (way unused by the way), a plot involving the Next? or the bugs revealed on Earth number blah,blah,blah. It wasn't until the final act and the characters explained what should have been a gut wrenching plan, if only the book spent more time coherently developing the characters beyond a strangely accepting and philosophical robot cat. Ich habe es schon öfter erwähnt - und ich sage es wieder: Die Reihe wird niemals mein Favorit werden. Und doch kann ich sie nicht einfach abbrechen. Warum? Ganz einfach. Mir gefällt die große Idee, die hinter der "Langen Erde" steckt. Denn in der von Terry Pratchett und Stephen Baxter geschaffenen "erweiterten" Version unseres Universums ist es wirklich nur ein paar kleine Schritte zwischen Hochkultur und Dschungelcamp. Nur eine simple Kartoffel, untergebracht in einem kleinen Kästchen mit Schalt Ich habe es schon öfter erwähnt - und ich sage es wieder: Die Reihe wird niemals mein Favorit werden. Und doch kann ich sie nicht einfach abbrechen. Warum? Ganz einfach. Mir gefällt die große Idee, die hinter der "Langen Erde" steckt. Denn in der von Terry Pratchett und Stephen Baxter geschaffenen "erweiterten" Version unseres Universums ist es wirklich nur ein paar kleine Schritte zwischen Hochkultur und Dschungelcamp. Nur eine simple Kartoffel, untergebracht in einem kleinen Kästchen mit Schalter, trennt seine Protagonisten von der rauen Wirklichkeit unbetretenen Territoriums. Und das beste dabei ist, dass dieses unbetretene Territorium auch noch in den verschiedensten Formen daherkommt. Von Wald-Welt über Wüstenplanet - alles ist dabei. Man muss sich nur entscheiden, in welche Richtung man aufbricht. Tja. Und dann wäre da noch der Plot, der sich nun schon über mehrere (übrigens recht dicke) Bände zieht. Denn im Grunde genommen lesen wir die Chroniken mehrerer Figuren, die sich zu einem Geschichte der Zivilisation unter den geschilderten Umständen verbinden. Das hat wunderbare Seiten (so lernen wir sie eben wirklich kennen) und negative Aspekete (manchmal ist das einfach langweilig). In "Das lange Utopia" zum Beispiel lernen wir eine neue Spezies kennen. Eine gänzlich neue. Nicht, dass wir nicht inzwischen wüssten, dass "da draußen" (oder vielmehr: da drüben) merkwürdige Wesen herumkrebsen. Aber diese Spezies ist schon noch einmal etwas ganz besonderes. Bloß: Sie ist im akademischen Sinn interessant, nicht aber für die Entwicklung der Geschichte selbst. Wie kann ich das wohl erklären ... Moment. Es ist, als würde einem "Breaking Bad" vorgelesen. Von der eigenen Urgroßmutter. Und sie lässt die "schlimmen Stellen" weg. Man ahnt, dass da viel mehr ist, vermutet die Bedrohung - und weiß so erst recht, was man verpasst. So ist eigentlich die ganze Reihe. Tja. Und jetzt? Jetzt habe ich den letzten Band auf dem Nachtkästchen liegen und weiß, dass ich ihn natürlich lesen werde. Weil - auch, wenn streckenweise eben jede Action fehlt und ich permanent das Gefühl habe, Stephen Baxter verrennt sich in Details ehe er drei, vier Minuten vor Abgabe drauf kommt, dass er ja noch zehn Handlungsstrenge auflösen und ein wenig Spannung applizieren muss - ich die Chroniken auf ihre ureigene Art interessant finde. This series of books makes me incredibly angry. It is a demonstration of the bizarre reaction that happens when you combine two authors who seemingly balance each other very well. Instead of fascinating science fiction concepts from Baxter with the exceptional character development from Pratchett you get uninspired characters from Baxter (whose work is rife with flat unbelievable people) and boring rehashed SF ideas from Pratchett (who is far better known for his use of wit than his ground break This series of books makes me incredibly angry. It is a demonstration of the bizarre reaction that happens when you combine two authors who seemingly balance each other very well. Instead of fascinating science fiction concepts from Baxter with the exceptional character development from Pratchett you get uninspired characters from Baxter (whose work is rife with flat unbelievable people) and boring rehashed SF ideas from Pratchett (who is far better known for his use of wit than his ground breaking ideas). These two took an idea for a series that was by no means revolutionary and instead of making it special with their unique skills as an author they just continued to force out tired over written and under plotted drivel. For a more interesting look at people with the ability to step between parallel earths try The Family Trade by Charles Stross and for a better version of the characters in this series try any other book. The plot drifts hither and yon with no regards for the basic concepts of pacing or linearity (or even a conscious disregard for linearity). The story collects characters like loose change and spends their lives in twee attempts to engender some emotional attachment to a story which ultimately delivers nothing in the way of real awe or amazement. While studded with creatures and places which could be fascinating or terrifying the story simply doesn't give them the time to shine in any meaningful sense leading to feeling of unreality about place which the authors want us to be able to imagine vividly. Over and over villains or disasters are built up only to be entirely undercut by the next book or brushed under a rug by a deus ex machina. This lack of suspense serves only to limit any empathy we might have for the frail shells of the almost human feeling protagonists. Humanity has reached the middle of the twenty first century. Datum Earth is never really recovered from the battering of the Yellowstone caldera and has slowly moved further into the Long Earths, and started to settle. Lobsang is now an elderly and tetchy AI, living on Springfield, an exotic earth deep in the Long Earth. Settled with Agnes, they have even adopted a child, but as he embraces normal life, there are strange sightings and unusual happenings in his new home. These strange and unusual Humanity has reached the middle of the twenty first century. Datum Earth is never really recovered from the battering of the Yellowstone caldera and has slowly moved further into the Long Earths, and started to settle. Lobsang is now an elderly and tetchy AI, living on Springfield, an exotic earth deep in the Long Earth. Settled with Agnes, they have even adopted a child, but as he embraces normal life, there are strange sightings and unusual happenings in his new home. These strange and unusual sightings have the potential the threaten all of the Long Earth Worlds, and this threat will bring together all of mankind, Ai and the hyper intelligent Next to counter it. In doing so, they may have to make the ultimate sacrifice. The Long Utopia (The Long Earth #4) by Terry Pratchett and Stephen Baxter is a long...slow and mostly boring read. I have enjoyed the previous books quite a bit even though I had problems with both books two and three. I guess my feelings on this one were pretty inevitable. The first 25 percent of this book involves pretty much nothing...sure there is a birthday and some stepping but very little happened. As a result I found myself bored and couldn't keep a focus on what was actually happening. I skim read through most of the rest and felt like this is probably it for me. I love The Long Earth series very much indeed and this, the fourth, is, I think, my favourite. Mixing sadness with light, it delves deeper into the hearts and souls of a very special group of people (not all of whom are entirely human) to investigate the nature of the Long Earths as well as the greatest threats challenging its survival. Después de dos novelas algo descafeinadas o que por lo menos a mi me transmitieron poco, La utopía larga me ha reconciliado con esta saga (aunque sigue habiendo cosas que no me convencen). El final de lo mejor, deseando que nos llegue traducida la conclusión de este viaje. Die Reihe "The Long Earth" von Terry Pratchett und Stephen Baxter stellt mich immer wieder vor ein grosses Problem: Ich erwarte etwas komplett anderes, als ich erhalte. So bietet die eigentliche Welt zwar viele tolle Grundsätze und Möglichkeiten für fesselnde Geschichten, aber leider finden die beiden Autoren auch im vierten Band "The Long Utopia" viele Wege diese zu umgehen. Bekannte Charaktere werden nicht wirklich weiterentwickelt, neue Personen so merkwürdig eingeführt, dass sie einem gar ni Die Reihe "The Long Earth" von Terry Pratchett und Stephen Baxter stellt mich immer wieder vor ein grosses Problem: Ich erwarte etwas komplett anderes, als ich erhalte. So bietet die eigentliche Welt zwar viele tolle Grundsätze und Möglichkeiten für fesselnde Geschichten, aber leider finden die beiden Autoren auch im vierten Band "The Long Utopia" viele Wege diese zu umgehen. Bekannte Charaktere werden nicht wirklich weiterentwickelt, neue Personen so merkwürdig eingeführt, dass sie einem gar nicht ans Herz wachsen können. Ebenso passiert zwar vieles, aber zugleich wirkt auch alles belanglos. In my opinion this is the second best book of the series, behind the first. It's the first book in the series that really tries to reach for its full potential, exploring new ways of utilizing the setting and characters, rather than recycling the same old exploration plot like books 2 and 3 did. I found this to be quite enjoyable, and it shows what might have been expected from the series if not for Sir Terry Pratchett's death earlier this year. Stephen Baxter has reportedly said that, out of re In my opinion this is the second best book of the series, behind the first. It's the first book in the series that really tries to reach for its full potential, exploring new ways of utilizing the setting and characters, rather than recycling the same old exploration plot like books 2 and 3 did. I found this to be quite enjoyable, and it shows what might have been expected from the series if not for Sir Terry Pratchett's death earlier this year. Stephen Baxter has reportedly said that, out of respect for Pratchett, he doesn't think he is going to continue the series beyond this volume, which is a decision that I understand and respect. (though that may just be a rumor, I don't know for sure) It's quite sad that the world was robbed of such a great and talented author just as this series was starting to find it's groove, and wherever Sir Pratchett may be now, I hope that he is happy. And those whom he left behind have my deepest sympathies. That said I really enjoyed this book. It's not just the same old thing like we got with the last couple books. It goes deeper into the nature of the Long Earth, and explores different ways of using it, different moral dilemmas and goes into detail on steppers in the past, and Joshua's parentage. I quite liked the Knights of Discorporea idea, and, if anything, the book could have used a bit more of their adventures. The idea of British secret servicemen using stepping to spy and make assassinations back in the 1800s is really awesome. And the idea of invaders from a different world conquering the Long Earth is pretty awesome as well. I only wish that the previous two books had gone in this direction and developed these ideas further. The constant movie references in this book made me laugh quite a bit as well. Kinda wimped out giving it a three, lol.. so went with a diplomatic four! What? Why did I want to give it a three, I hear you ask! Well, I'll tell you for why! Although I have enjoyed all four of these books, I can't help feeling that it's kinda indecisive. It just can't seem to decide whether it's going to be one long interconnected story that's going to build up to one final and brilliant climax or individual stories that only have a few interconnected bits. Personally, I think what this series Kinda wimped out giving it a three, lol.. so went with a diplomatic four! What? Why did I want to give it a three, I hear you ask! Well, I'll tell you for why! Personally, I think what this series needs is one long interconnected story etc etc. I've enjoyed them separately, don't get me wrong but I just feel that someone wants it to be a long story, ahem, and someone else wants it to be individual and it just causes a bit of confusion in my ole noggin whenever I finish a book and that influenced my 3* (if I hadn't wimped out and gave it a 4*) decision. The Long Earth series of books presented an intriguing idea, that of being able to 'step' into parallel Earths, each an untouched wilderness and each one slightly different until they became very different planets. How would this affect people on a personal level and how would it affect the social and political stability of the original 'Datum Earth'? The second book, The Long War explored the political theme further with the superpowers attempting to control the equivalent populations on the oth The Long Earth series of books presented an intriguing idea, that of being able to 'step' into parallel Earths, each an untouched wilderness and each one slightly different until they became very different planets. How would this affect people on a personal level and how would it affect the social and political stability of the original 'Datum Earth'? The second book, The Long War explored the political theme further with the superpowers attempting to control the equivalent populations on the other Earths - and mostly meeting resistance to any governance at all. It also introduced the concept of the Next, a super intelligent sub-species of humanity. The third book, The Long Mars had further incredible iterations of Earth on display and also did the same thing for Mars on a quest to discover a material to use to make a space elevator. The Next also started to organise and to separate themselves from the rest of humanity. Each of these took the original concept and gave us more interesting worlds and lifeforms. Although the law of diminishing returns was starting to bite - Earth fatigue if you like - the main interest was in seeing what new ideas the authors could wrestle for each new Earth or Mars. That is where this book fails. It is almost exclusively interested in only one copy of Earth, which comes under direct threat. All the usual suspects - Joshua, Sally, Lobsang and the Next must join forces to prevent a catastrophe threatening the whole Long Earth. There is also a sub-plot involving Joshua's antecedents which although interesting in itself is essentially a Long Earth short story of no relevance to the rest of the plot. Whereas the previous books had a sense of wonder at each world, this loses that completely. It is in fact a completely standard science fiction story and probably would have been better told as a stand alone story rather than being shoe-horned into the Long Earth concept, which doesn't actually add anything interesting to it. It reads very much like Baxter wanted to write a story about a Dyson motor and as he was contracted to write a Long Earth novel, that's what was used. Unfortunately even this story is not well told with stilted and flaccid dialogue, zero character development and no dramatic tension at all. It was a real struggle to read in places, there is no zip or flow to the story or writing. Various bits of the plot don't make a great deal of sense and the ending is very lame indeed with the chain of Long Earth worlds being essentially fixed by just thinking about it. The Next decide that Stan Berg, a newly discovered one of their kind, is the only one to 'fix' this despite basically no contact. They are supposed to be super intelligent and think many moves ahead but this just struck me as absurd. The first Pratchett book to come out since the chap who talks in capitals came for him, and as such sure to be a melancholy read whatever its content. Though obviously this series was always a collaborative effort, and in some ways this one feels tilted more Baxter's way than its predecessors. There are occasional bursts of stilted dialogue, undigested exposition and repetition more familiar from his work than Pratchett's – though as with such an assessment of any collaboration, this is pure inf The first Pratchett book to come out since the chap who talks in capitals came for him, and as such sure to be a melancholy read whatever its content. Though obviously this series was always a collaborative effort, and in some ways this one feels tilted more Baxter's way than its predecessors. There are occasional bursts of stilted dialogue, undigested exposition and repetition more familiar from his work than Pratchett's – though as with such an assessment of any collaboration, this is pure inference on my part, and very likely wrong. The first Long Earth book, too, where I read a review before getting my own review copy. First world problems, I know, having to wait for the very fine local library service to hook me up. The reviewer in question liked this more than anything in the series since the first book, because it felt more like a novel again. I feel pretty much the opposite about that return to conventionality, especially disliking the misplaced historical subplot here. I liked the intervening books, the way the characters and the plots had become little more than an excuse for unfettered world(s)-building. But then I like Olaf Stapledon, whose influence is still strong here, and who was usually much more interested in the big picture than standard novel business. That said, like this book he would find time for the occasional uneasy encounter between humans and their strange progeny, in which the lacks on both sides are felt as forcefully as the benefits. I was reminded too of John Crowley's 'Great Work of Time', and several stories by the great Clifford Simak - the eponymous 'Utopia' here is at least partly bittersweet, a sense that the great human experiment is being abandoned for a more pastoral and nomadic life in the endless forests of the Long Earth. A utopia to some, but a quiet apocalypse or dying fall for others, especially the old-timers who remember a humanity confined to one Earth. At times, the back-to-nature thinking involved is just maddening; there's one scene which is clearly supposed to be heartbreaking, but is instead as needless and infuriating as the finale of [a popular recent-ish SF series I don't want to drive-by spoiler, just in case]. Suffering severe book series withdrawal. I need the 5th book Now! Cuarta entrega de la serie que se iniciara con "La Tierra Larga" que versa sobre una infinita cadena de Tierras paralelas donde la humanidad nunca se ha desarrollado y de un aparatito, cuya pieza fundamental es una patata, que da la posibilidad a casi todos los humanos de cruzar de una a otra. Unos pocos tienen una cualidad natural y no necesitan de estas cruzadoras para realizar sus traslados, otros no pueden hacerlo en ningún caso. La infinitud de mundos disponibles no se encuentra exenta de problemas, como muy bien han descubierto los protagonistas recurrentes a lo largo de las tres novelas antecedentes —de recomendable lectura antes de enfrentar la de la reseña—. Tramas de complots y terrorismo, desastres naturales, viajes a millones de Tierras alternativas de distancia, seres inteligentes terrestres pero no humanos, Inteligencias Artificiales, el descubrimiento de un Marte Largo, un nuevo paso evolutivo en la raza humana hacia un homo superior..., dan paso ahora a una amenaza de proporciones universales. Cabe avisar , como sabrá quien haya leído los anteriores, que no hay que llegar a estos libros buscando el humor satírico de Pratchett, sino más bien muchos de todos esos temas de calado humano con los que gustaba cargar de profundidad sus obras. De hecho, la Tierra Larga fue un proyecto que tuvo en mente durante muchos años, sobre el que incluso escribió el relato "The High Meggas", pero que no llegó a cristalizar en nada más hasta surgir la colaboración con Baxter, dando entonces lugar a una serie de ciencia ficción más cercana al hard de uno que a la fantasía desbocada del otro, llena de sentido de la maravilla, ideas y tecnologías sorprendentes, y cierto dispersamiento temático. Jeg kan ikke anbefale denne serie nok! Bog fire bygger videre på de muligheder som The Long Earth giver menneskeheden, samtidig med at den sætter spørgsmålstegn ved om disse nu interdimentionelle væsner stadig er mennesker eller om de der naturligt 'stepper' er en helt ny art. Better than I feared ... that's the best I can say about it. Before I forget, I must credit the sly inclusion of having Lobsang say that one thing he knows about is sweeping. Those who have read Pratchett's Thief of Time will have appreciated that. Now let's see, which Lobsang said that? So. Long Utopia? The Utopia concept is mentioned only slightly more than Mars, which is to say in about eight words. And buh-bye beanstalks, because we spent a lot of time writing them in only to realize that we Better than I feared ... that's the best I can say about it. So. Long Utopia? The Utopia concept is mentioned only slightly more than Mars, which is to say in about eight words. And buh-bye beanstalks, because we spent a lot of time writing them in only to realize that we can't DO much with them, so let's handwave reasons why they were feasible but suddenly aren't. We have a lot of characters and groups of characters to wrap up here. So let's start slowly and not get the reader all excited. Remind readers that Sally is Mysterious and Important. Maybe some flashes from the moon. Mention Yellowstone a lot so we don't forget it. Let's have a whole bunch more of Agnes and Lobsang sighing and all "I just want .." With the occasional reminder about Sally. Now a tedious aside, which was predictable because any time Nelson appears the air is sucked out of the room. Let's read about a man named Valiente in Victorian times, then puzzle through the clues as Joshua is shown his ancestry. And completely fails to say to Nelson, "That's nice, so what?" Steppers have been around a while. Why does that matter? Sally is what matters! And now here's Stan. Stan's special. That's a good idea, because this series didn't have anyone special in it till now. No dead people in android bodies. No one who can step through soft places. But I will accept that a Next Next is a reasonable extrapolation. We need a crisis if we're ever going to get out of this plot. So here we are at world 1,243,567, because Sally "just knew." And she just knew who she'd need. But first, let's explain the beetles and the pathways. Let's drop in a huge new idea completely out of nowhere, an idea that could easily carry a new series all by itself. There's our crisis! Cue the stunned military guy, who is a complete idiot but somehow rose past the geniuses below him, as they always do in novels. Cue the rabble, with the "No! This is our home!" even when the place is demonstrably disintegrating. The book does develop the crisis well, from here's what's happening to uh-oh, here's WHY it's happening. Suddenly, foot-in-mouth fools-rush-in Stan has become a demagogue [aside: it is possible, ref. Donald Trump] whose honeyed words can move masses. Well, we can't be having with that, can we? Would Stan be torn apart by the mob, or do the authors have something bigger lined up for him? We don't know. Bet Sally does. I'm starting to find Sally rather annoying. The ending? Pure schlock. Melodrama. Cloying. Twee. And probably the only way out of the narrative corner the authors painted them into. But really. (view spoiler)[ Stan and Sally can break the skein of worlds, snip out the offending planet, reconnect the skein .... and they can't pop themselves out to safety? (hide spoiler)] Pfui. The only POSSIBLE explanation is narrativium: it had to happen for dramatic reasons. One: you can't top a Noble Sacrifice. Two: They've become so powerful that we can't leave them in the plot. They've almost gone beyond Superman spinning the world backwards to make it didn't happen. I have adored every moment of The Long Earth series, a brilliant collaboration by Terry Pratchett and Stephen Baxter. I like the story of parallel Earths and humans exploring them, although this fourth book has a slightly different feel- there's no epic journey here. It's still superb though. The main plot sees sort-of-AI Lobsang fake his own death and go and live an ordinary life with Agnes. 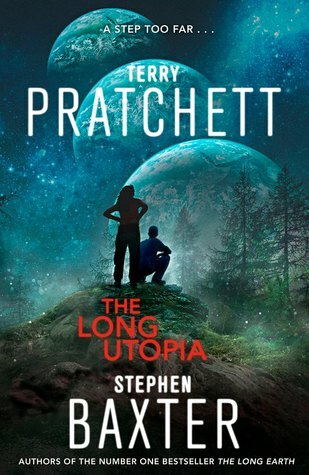 But something on the world they end up living on is not right and it becomes apparent that a great threa I have adored every moment of The Long Earth series, a brilliant collaboration by Terry Pratchett and Stephen Baxter. I like the story of parallel Earths and humans exploring them, although this fourth book has a slightly different feel- there's no epic journey here. It's still superb though. The main plot sees sort-of-AI Lobsang fake his own death and go and live an ordinary life with Agnes. But something on the world they end up living on is not right and it becomes apparent that a great threat has been discovered, something which could have huge consequences across the Long Earth. It's the first time the series has really had a genuine antagonist. There's always been disagreements but usually neither is a bad person/creature. Here though we are introduced to something rather different and it'll take most of the characters we know and love to fight the threat. Baxter has told some great "world threat" stories in the past and it works here well. Unusually for the series this book almost entirely focuses on that plot line, but there is one other one. Instead of taking us East or West across the Long Earth the story takes us back in time as we see the story of Joshua Valiente's ancestor Luiz. We get a whole brilliant story of Luiz and Victorian steppers which feels very true to the universe yet tells its own story excellently. It was not something I was expecting but I adored it. I suspect these sections were more from Pratchett than Baxter- some of the characters were very Pratchett. It had a slightly different feel than previous books but I enjoyed this just as much. With the sad death of Terry Pratchett earlier in the year this looks like it will be the last in the series but there is certainly scope for more- I hope Baxter and Pratchett had some sort of plan because it feels like there ought to be a fifth book. But if not this was a satisfying end to a remarkably ingenious series. If you've enjoyed the previous Long Earth books, this is a must-read! Now, I must admit that the last one and this If you've gotten this far in the series, you might have some questions and a desire to see some of the stranger threads come together, like the parentage of our MC's, some of the hints of the stranger alien/Earthlings, the oddest Earths, and, of course, Lobsang. The Long Earth universe has unlimited potential, literature-wise. So, imagine my disappointment when books 2 and 3 in the series were no more than rehashes of the first novel, in which we are introduced to an endless string of Earths that people can travel, or "step" to, with the help of a potato. The Long Earth is a novel of discovery. We follow the characters as they travel from Earth to Earth and witness the staggering array of worlds and lifeforms, intelligent and not, that make up the Long The Long Earth universe has unlimited potential, literature-wise. So, imagine my disappointment when books 2 and 3 in the series were no more than rehashes of the first novel, in which we are introduced to an endless string of Earths that people can travel, or "step" to, with the help of a potato. The Long Earth is a novel of discovery. We follow the characters as they travel from Earth to Earth and witness the staggering array of worlds and lifeforms, intelligent and not, that make up the Long Earth. I, personally, forgive the authors for cramming it full of stepping and descriptions of Earths instead of focusing on an intricate plot. It is, after all, an introduction to a whole new universe, both for the reader and for the characters. The Long War is The Long Earth but with a different title. There is only the barest hint of a war, most likely because the authors were preoccupied with stepping. The Long Mars is The Long Earth but on Mars. Plot points are introduced, but the story never really goes anywhere, unless you count all the friggin' stepping. With The Long Utopia, we finally get a novel that focuses on plot instead of countless chapters crammed full of stepping. I was pleasantly surprised by the actual plot development, the buildup of tension, and the ending that read like an actual ending instead of something the authors tacked on because, well, a book's gotta have an ending. This book also did a much better job of pulling the events and characters of the previous books together. While it's not without its faults, it's still a damn sight better than the previous two in the series. Im 4. Buch um den Zyklus der "Langen Erde" kommt es zu einer Begegnung mit einer außerirdischen Lebensform, die nicht in der Weltenkette der Parallelen Erden beheimatet ist. So wie der Roman von den Hard Science Ideen eines Stephen Baxter beseelt ist, so wurde auch der Kontakt, oder Nichtkontakt, zu der Roboter-Zivilisation, die sich einer Erde in den Hohen Megas (viele Millionen Schritte von unserer Datums-Erde entfernt) bemächtigt haben und nichts anderes zu tun haben, als sie mit Hilfe eines Im 4. Buch um den Zyklus der "Langen Erde" kommt es zu einer Begegnung mit einer außerirdischen Lebensform, die nicht in der Weltenkette der Parallelen Erden beheimatet ist. So wie der Roman von den Hard Science Ideen eines Stephen Baxter beseelt ist, so wurde auch der Kontakt, oder Nichtkontakt, zu der Roboter-Zivilisation, die sich einer Erde in den Hohen Megas (viele Millionen Schritte von unserer Datums-Erde entfernt) bemächtigt haben und nichts anderes zu tun haben, als sie mit Hilfe eines Dyson-Motors zu zerstören, warum, das wird nicht erörtert. Die Protagonisten der vergangenen Bücher sind in ihren Hohen Altern mit von der Partie, Joshua Valiente erfährt das Geheimnis seiner Vorfahren, Lobsang versucht sich dem Menschsein zu nähern, indem er mit Schwester Agnes und eine adoptierten Kind sich auf dem besagten Planeten niederläßt, bei dem die Tage immer kürzer werden, bis sie dahinterkommen, dass die Aliens dahinterstecken. Sally Lindsay opfert ihr Leben, um die Welt der Aliens von der übrigen Landen Erde abzuschotten, man will unbedingt verhindern, dass die Aliens Zugriff auf die Lange Erde erhalten. Well if this is how the series finishes, it's not a bad way to go. If you've read the previous three books, and if not, why not, then you'll have a fairly good idea where this one is going to end up. The Travelling aspect of the previous books has been turned down a bit, and a lot of the book takes place on one particular world. Lobsang and Agnes have retired to one of the frontier worlds, one recommended by Sally, but things there aren't quite as settled as they would like it to be. The issues Well if this is how the series finishes, it's not a bad way to go. If you've read the previous three books, and if not, why not, then you'll have a fairly good idea where this one is going to end up. The issues the world has forces the old gang back together again, with a new addition. The "Next" have a new member, Stan, who is incredibly reminiscent of Valentine Michael Smith from Stranger in a Strange Land. Mixed in with the modern day action, is a history of the steppers, or Waltzers as they were called in Victorian England. Yes, we're back to Victoria again, a period Pratchett seems to really like. This time we are following the history of Joshuas family tree as the stepping ability is given a possible explanation. All in it's a fairly strong way to end the series off. The plotting is beautifully done, as you'd expect, and given what we know of the major characters from prior books, everything makes sense. If I had a quibble it'd be some of the dialogue just feels stilted, but that may just be me. I'll miss the long Earth. These books are different, fascinatingly so. With the setting and characters now well established, a more traditional science-fiction plot than those of the first three books emerges—contact with inscrutable aliens. But this story is equally thought provoking...and seems to leave the door open for further exploration. As an aside, Terry Pratchett has long been my favorite author. The Long Earth series that he created in collaboration with Stephen Baxter only goes to exemplify how much potential h These books are different, fascinatingly so. With the setting and characters now well established, a more traditional science-fiction plot than those of the first three books emerges—contact with inscrutable aliens. But this story is equally thought provoking...and seems to leave the door open for further exploration. Another stunning installment of the Long Earth cycle. These are some of the only books I make a point of buying in hard cover the day they release, simply because I feel I'm paying homage to an amazing series. The books are so good, they deserve to be read on paper and paper only. I took my time with this one, savoring every word, and I'm glad I did. The only part I didn't absolutely love were the flashbacks, but that's probably because I don't feel they actually went anywhere, yet. This series Another stunning installment of the Long Earth cycle. These are some of the only books I make a point of buying in hard cover the day they release, simply because I feel I'm paying homage to an amazing series. The books are so good, they deserve to be read on paper and paper only. I took my time with this one, savoring every word, and I'm glad I did. The only part I didn't absolutely love were the flashbacks, but that's probably because I don't feel they actually went anywhere, yet. This series mixes the heart and soul of a human being with the hard science and sociology of humanity itself, and it does so in the most enjoyable way possible. I like that this book returned to the character level, as well, and finally started to bring back events from earlier, leading toward a conclusion that will no doubt be emotional and amazing. I can't wait for the finale.